With a history going back to the mid-80’s and a number of releases behind them, Radiopuhelimet (The Radiophones) are a solid player in the Finnish psych scene. When Jerry sent this to me, he compared them to fellow Fins Circle, albeit without the Krautrock influences. I haven’t heard Circle, but I can tell you what I hear of Radiopuhelimet. 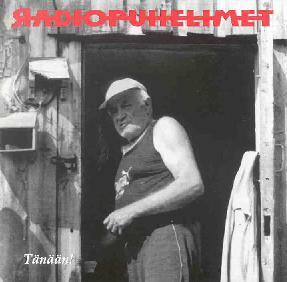 Their latest album, Tänään! (Today! ), is chock full of raw, spirited, and dynamic rock n’ roll with a definite though not overtly psychedelic edge. Sometimes, like on the opening track Jäätie, the band give their music a stripped down garage rock feel. The vocals, which are sung in Finnish, are belted out with a grin and snarly attitude. Elon Kehä on the other hand, burns along to a decidedly funky groove, with some cool accents on the organ. One of my favorite tracks, the dark Maanantaita starts out a little on the mellower side, but then shows a surprising touch of early King Crimson influence, with it’s layering of jazzy horns and heavy guitar chording. Hindustan is an excellent psyched out instrumental track with garage and surf rock touches. The heavy, wasted blues of Heinäkuu has an almost Black Sabbath feel to it, and I love that distant, gritty harmonica! The best track is the 8 ½-minute closer, Mulla Menee Liian Lujaa, which starts out with a bit of spacey Eastern psych that flows into the main pounding rhythm of the song. More of the King Crimson influences work their way into the sound as the band explores jazzy, angular rock structures before the song breaks into a bouncing, hook-laden psychedelic pop coda to finish things off. Great stuff! Every track on the album has a nice, raw feel to it, without being lo-fi, and the album has an excellent balance between blistering garage psych and a more complex sound, without sounding confused. It all works together because Radiopuhelimet have developed their own sound, which they stamp on whatever kind of music they’re playing. For more Info, visit Radiopuhelimet at their web site: http://www.radiopuhelimet.net. The site is in Finnish, but they do have an English page at: http://www.radiopuhelimet.net/historia/history.htm. Tänään! is distributed by Hot Igloo. You can visit their web site at: http://www.hotigloo.com. Contact via snail mail c/o Hot Igloo; Asemakuja; 92470 Tuomioja; Finland.